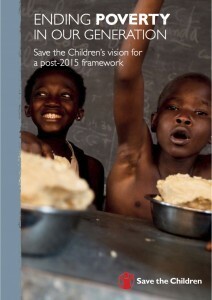 On January 8 Save the Children published its proposals for the post-2015 global development framework. Running through this are two key principles: learning and equity. Giving every child a chance to learn – particularly the poorest – is a central part of this framework. We believe passionately that our generation is the first that can realistically talk of ending a series of global injustices. A world without poverty and without preventable child and maternal deaths is within our grasp. Education is no different. It falls to our generation, to ensure that no child is denied their right to education and no child’s life chances are cruelly limited by poor quality schools and limited opportunities to learn new skills. That is why for education the global goal we are proposing is that “by 2030 we will ensure children everywhere receive quality education and have good learning outcomes”. To underpin this goal our framework has three targets. We propose indicators for each target in the report. Save the Children would welcome thoughts on any of our proposals, but in particular we’d be interested in whether you think that the important elements of equity are captured in our proposed framework. You can read a full blog post, Ending the learning crisis: education and equity after 2015 by Desmond Bermingham, Gerd-Hanne Fosen, Will Paxton and Dan Stoner on the EFA/GMR Blog. Please post your replies to Will’s question below.